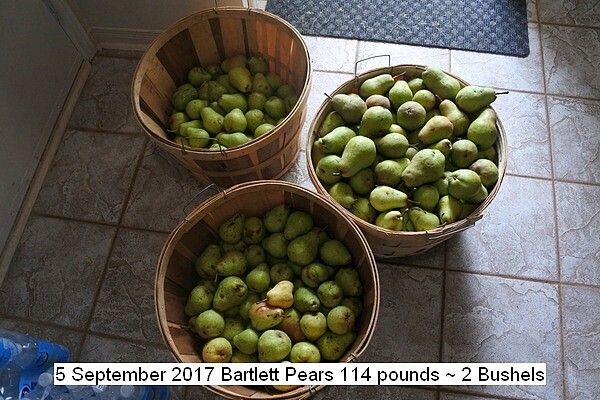 About two bushels of Bartlett Pears were acquired from two places for making juice. A bushel is 60 pounds. Fifty six pounds were a present from a private garden. Fifty eight pounds dropped fruit were purchased from a commercial grower at 30 dollars a bushel. They have to be ripened off the tree by testing when the shoulder is slightly soft to the touch before processing into juice. It takes about a week to ripen at room temperature. Pears are excellent quality this year. This entry was posted in Uncategorized and tagged 5 September 2017 Bartlett Pear, Bartlett Pear. Bookmark the permalink.